Are you looking for a fun activity to do with your family? 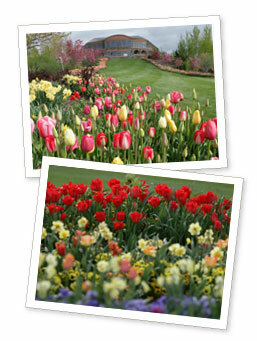 From April 16th to May 1st you can “get in and go” to Thanksgiving Point for their Tulip Festival. Thanksgiving Point is located in Lehi, Utah and the Thanksgiving Point water tower can be seen from I-15. The Tulip Festival is located at the Thanksgiving Point Gardens. When driving from the north or south you get off the freeway at exit 284 (Alpine/Highland) and head West. From the light continue West on Clubhouse Drive and when you get to Garden Drive turn right and continue driving to the Gardens Visitor Center. This is the beginning of your adventure. The Tulip Festival boasts over half a million tulip bulbs in their gardens. There are several gardens each filled with thousands of beautiful spring flowers. Every day is filled with gardening education demonstrations, live entertainment and guided garden tours. The schedule of events can be found here. Don’t forget to take your camera because you can also enter the Annual Tulip Photography Contest. Winners will be featured in the Salt Lake Tribune and Deseret News and receive a Duo Thanksgiving Point Memebership. There are several age group categories for entrants so everyone has a chance. Get in and go with your family and enjoy the beauty of the Thanksgiving Point Gardens Tulip Festival. Admission is $10 for adults, $8 for children(3-11) and $9 for seniors or free for Thanksgiving Point and Gardens members. Great blog post dude, thanks for sharing.